Mutaz Essa Barshim reacts to clearing the bar at the 2017 World Championships. It would be too easy to write something in this space about Mutaz Essa Barshim scaling new heights in 2017, or leaping into the next stratosphere of his sport, or some other metaphor involving the aerial ability of the world’s best high jumper. Barshim, a 26-year-old Muslim from Qatar, was announced last week as the winner of the IAAF Male Athlete of the Year. It is among the highest honors in track and field that isn’t an Olympic or world championship gold medal. 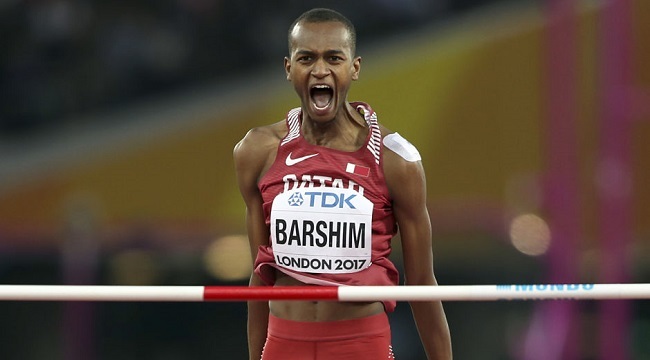 In 2017, Barshim went undefeated in 11 international competitions. He won gold at the IAAF World Championships in London with a jump of 2.35 meters (7 feet, 8.5 inches). He cleared a personal season-high and world’s best 2.40 meters (7 feet, 10.4 inches) at a Diamond League meet in Birmingham, England, and again at the Eberstadt High Jump meet in Germany. He clinched the Diamond League season title with a 2.36-meter jump in Zurich, Switzerland. Another display of Barshim’s dominance this year: Nine of the best 11 high jumps in the world in 2017 were made by Barshim. He was to track and field this year what Kobe Bryant was to the NBA in 2005-06, when he had an 81-point game, a 62-point game, and more than a few 40- and 50-point games. That season, it seemed almost every one of the league’s most incredible scoring performances belonged to Kobe. Barshim was joined on the stage at the IAAF Athletic Awards by Nafissatou Thiam of Belgium, who was named Female Athlete of the Year. Thiam won the heptathlon gold medal at the World Championships in London and posted the third-highest heptathlon score in history (7,013 points) at the IAAF Combined Events Challenge in Gotzis, Austria.